Founded in 1959, York University is Canada's third largest university, and is a leading interdisciplinary research and teaching institution. York is a vibrant community of over 60,000 faculty, staff and students building their own unique paths to success. 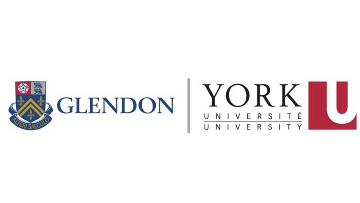 Glendon College is a Faculty of York University. It is located on its own campus in midtown Toronto and has a unique mission to provide a world-class liberal arts education within a bilingual (English and French) framework. Through funding from the Ontario government, Glendon College was designated in 2008 as the Southern Ontario Centre of Excellence for French-Language and Bilingual Postsecondary Education. It currently offers undergraduate and graduate programs and certificates in a range of subject areas in the liberal arts and sciences. Glendon's campus is home to 2,600 students who also have access to a wide range of courses at all levels at York's main Keele campus. Glendon has a strong tradition of inspiring inquiry and empowering students to become fully engaged changemakers while providing students with the knowledge, languages and skills to contribute to an increasingly global and multilingual workforce. Reporting directly to the Provost and Vice-President Academic, the Principal is the equivalent of a Dean and as such, plays a crucial role in the shared academic leadership and governance of York University, as well as in the direction and administration of the College and the promotion of excellence in its teaching, research and service missions. The Principal will work closely with the francophone community and the government to play a significant role at the provincial and national levels in positioning Glendon’s centrality in bilingual education in the multicultural Canadian context. York University is seeking a dynamic and creative leader to assume the role of Principal of Glendon College for a five-year term commencing July 1, 2019. In addition to being fluent in French and English both oral and written, the successful candidate for Principal will bring outstanding academic qualifications, significant leadership and administrative experience, exemplary interpersonal skills, a demonstrated dedication to student success and engagement and a commitment to liberal arts, bilingualism and intercultural awareness. In accordance with the Accessibility for Ontarians with Disabilities Act (AODA), accommodation will be provided by both Kenniff Leadership and York University throughout the recruitment process to applicants with disabilities. York University is partnering with the executive search firm Kenniff Leadership on this search process. Written nominations, applications or expressions of interest for the position should be submitted in confidence to the addresses shown below. Applications should include a letter of introduction, curriculum vitae, and the names of three references (who will not be contacted without consent of the candidate). Consideration of candidates will begin in early 2019.